By David Behrens in The Yorkshire Post. It was on Sunday morning, on a March weekend milder than this, that the villagers filed out of their parish church on the edge of the Peak District. They never went back. 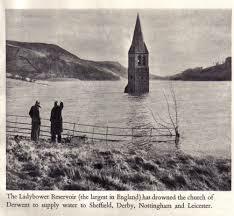 The church bell that day, exactly 75 years ago, sounded the death knell for Derwent. Within weeks, it had been abandoned to its fate. It was one of two “drowned villages” sacrificed to the demand for mains water in South Yorkshire. The Ladybower Reservoir engulfed it and the neighbouring hamlet of Ashopton – the bulldozers trundling in as the RAF practiced overhead for the Dam Busters raid they were planning to inflict on Germany. The war memorial has been all that’s left of Derwent – until now. In a surviving village a couple of miles away, they are putting the finishing touches to an exhibition of 160 remarkable and rarely-seen photographs. Postcards produced for the tourist trade, mounted in an album and kept for generations by a collector, were auctioned last year. A few were previewed at the time – but the entire collection, digitally enhanced and enlarged, some in colour, is now about to go on view.